I had a crazy idea last week. I knew that had to be a better way for painting plaid or textured cloth. I hadn’t seen any method quite like this. It may be a new concept, but I am not going to claim so.  With no further ado… on with the experiment! When given enough contrast, repeated glazing will produce the appearance of textured cloth. 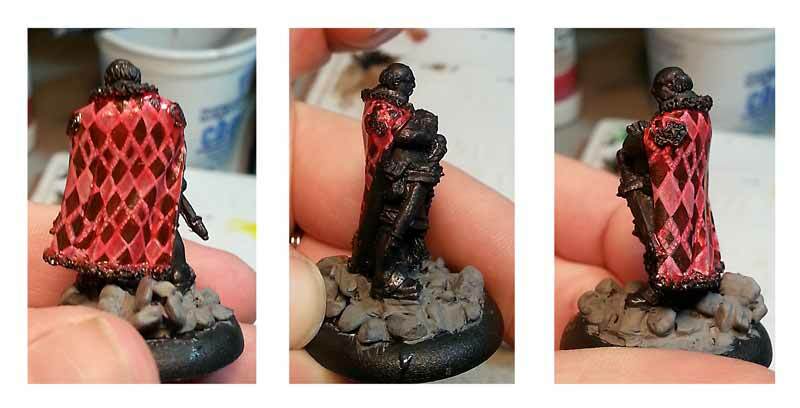 First I started with a black primed mini. 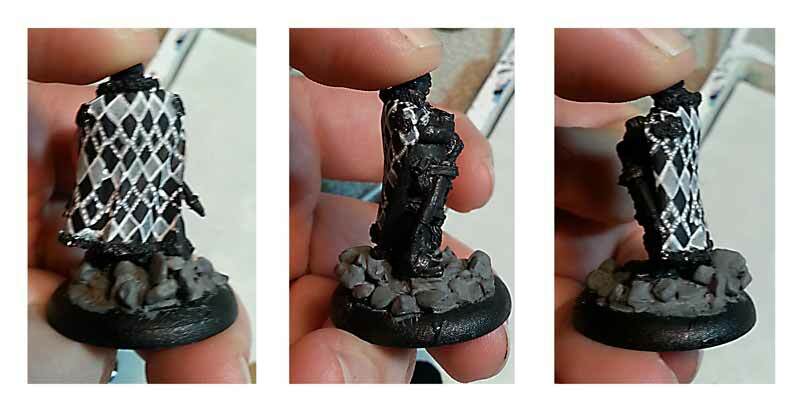 This process should also work if you have a white primed mini, but the results on a grey primer may not be as noticeable. My idea here was to use the contrast between the primer and pattern to produce the apparent texture. I painted a texture on the cape. As you go, keep in mind the folds in the fabric. If you are unsure how your pattern would look through the folds, it’s time for a field trip! Take a camera or your camera phone to your local fabric store. Take some time and find a pattern you want to mimic. 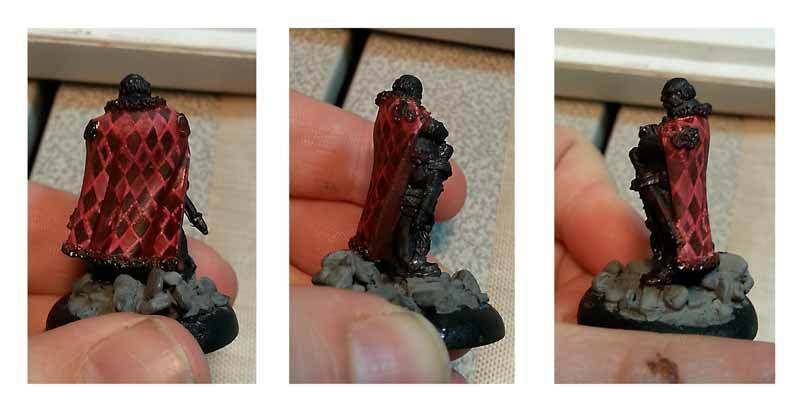 Roll it out a bit in a similar fashion to the miniature you are wanting to paint. Study the way the pattern shifts slightly around a curve. Take a picture as needed. Make sure you roll the fabric back up and put it back where you found it. Fabric stores are hobby stores for a different type of nerd (yes, quilters are nerdy for quilts just like you are nerdy for *insert here*). You wouldn’t want someone coming into your FLGS (friendly, local game store) and mucking about. Technically I think this method is called a “glaze.” The idea is that the paint tints the whole area with the color used. 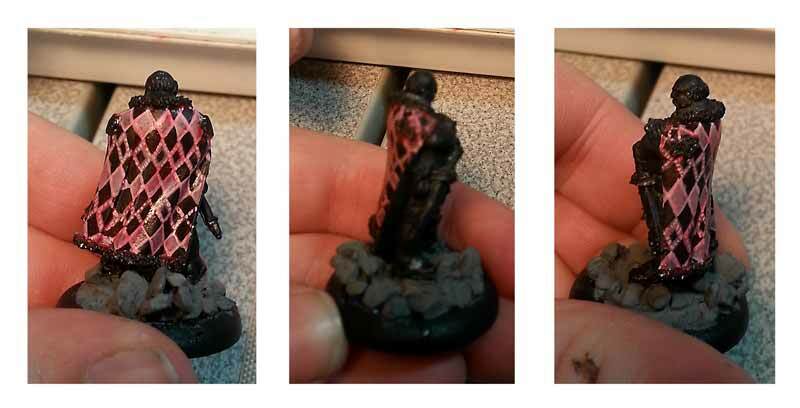 I chose the Baal Red wash for this particular project. Washes are basically thin paints. Can’t afford one of the washes or shades out there (or don’t want to spend it)? You can used a thinned down acrylic paint. You want the consistency of skim milk for this purpose. It is a bit more unpredictable to work with thinned acrylic and takes some practice and experimentation. Basically cover the whole mini, but don’t let the wash pool in the recesses. It is handy to have a dry paintbrush handy to soak up the areas that pool. Don’t over-work the wash (don’t mess with it too much). Mop it on quickly and leave it alone. As the layer starts to dry in some areas and not in others you will start to ruin the even coat if you are moving it around too much. LET THE PREVIOUS LAYER COMPLETELY DRY. Sorry to shout, but really, let it dry. How can you tell it is dry? It’s not shiny anymore. Next, another coat. You will start to notice less contrast and more color starting to appear. Again, let it dry before you do another coat. Neat. It’s starting to come together! I really liked now this was coming together, but I wasn’t getting the depth I wanted. 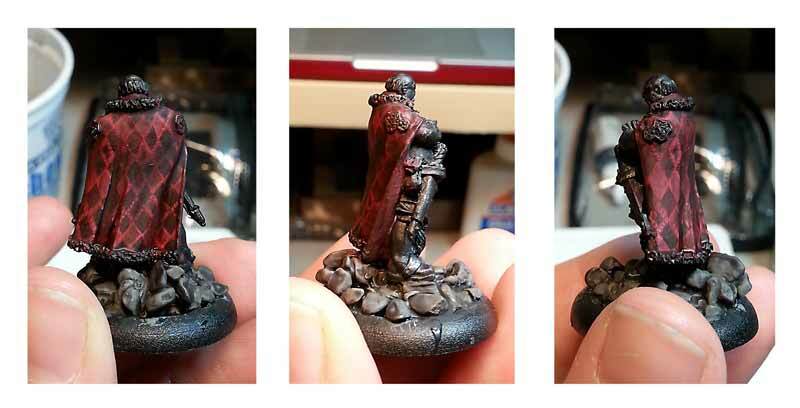 This layer I used the GW Nulin Oil (black) shade. The shades are basically washes and behave the same. Shades are typically the darker and have a tendency to flow to the recesses as opposed to the Baal Red wash that gave better overall coverage for the color shift. Covering the whole area with the black toned down the red quite a bit. I didn’t want a neon red cloak. After the first dark layer I went back in with a more targeted wash. I went over the areas that would be in shadow to really increase the depth. This included the slight dip in his back just below the shoulders. I would call this experiment a success! The layers of color created a fairly subtle pattern that looks like it is part of the cloth and not painted on or sewn in. There are a few things I may change for the next time or experiment with further. Start with a base that is already highlighted instead of flat primer. The layering created great shadows, but I am not completely pleased with the lack of highlight. Try thinner lines or a more organic pattern. This may be an interesting trick for burlap or worn cloth. Instead of starting with white or a neutral tone, I wonder if a light blue or green would produce more dynamic results?